ISLAMABAD: The newly elected parliamentarians of the Lower House on Monday took oath of their office during the inaugural session of the 15th National Assembly. Outgoing speaker Sardar Ayaz Sadiq, who presided over the National Assembly session, administered the oath to the newly elected members of the parliament, which included a lot of new faces. The session started with playing of the national anthem, followed by recitation of the Holy Quran. 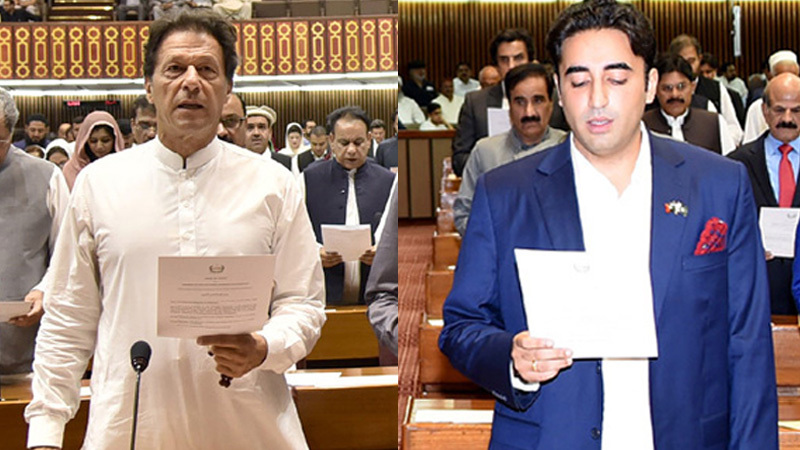 PTI Chairman and prime minister-in-waiting Imran Khan, PPP Chairman Bilawal Bhutto, Co-Chairman Asif Ali Zardari and PML-N President Shehbaz Sharif were prominent among those who took the oath. Several well-known faces made their way into the National Assembly for the first time as members. Bilawal Bhutto, Shehbaz Sharif, Jamhoori Watan Party’s (JWP) Shahzain Bugti and Sardar Akhtar Mengal made their maiden entry as members of the parliament. Various leaders of Pakistan Tehreek-e-Insaf (PTI), including Asad Qaisar, Raja Khurram Shahzad, Farrukh Habib, Zartaj Gul, Andleeb Abbas, Faisal Vawda and Ali Zaidi, also made their debut in the assembly. Bilawal took the oath as member of parliament for the first time, whereas his father returned to the House after more than two decades. Interestingly, former interior minister Chaudhry Nisar Ali Khan, former prime minister Shahid Khaqan Abbasi and former railways minister Khawaja Saad Rafique were not able to take a seat in the assembly. Jamiat Ulema-e-Islam-Fazl (JUI-F) chief Maulana Fazlur Rehman, Mahmood Khan Achakzai, Aftab Sherpao and Abid Sher Ali also failed to convince their voters. Former prime minister Nawaz Sharif, Daniyal Aziz and Talal Chaudhry were disqualified and declared ineligible for the elections due to cases against them. The National Assembly witnessed unique distinction in which three parliamentarians and their sons took oath as members of the House. Those are: Asif Ali Zardari and his son Bilawal Bhutto; Pervaiz Malik and his son Ali Pervaiz Malik; and Makhdoom Shah Mehmood Qureshi and his son Zain Qureshi. According to the proposed schedule, the elections for the speaker and deputy speaker of the National Assembly will be held on August 15. Candidates up for the coveted posts will file their nomination papers to the speaker’s office on August 14. The speaker will be elected first after which he will conduct the election of the deputy speaker. The deadline for the submission of the nomination papers for the prime minister’s office is 2:00pm on August 16 and the election of the prime minister will be held the next day (August 17). President Mamnoon Hussain will administer the oath to the prime minister after his election. It is pertinent to mention here that the PTI has nominated party chief Imran Khan as its candidate for the prime minister’s office. The party has nominated Asad Qaiser for the post of National Assembly speaker. The joint opposition, comprising 11 political parties, has fielded Khursheed Shah for the post of speaker and Maulana Fazlur Rehman’s son Asadur Rehman for the post of deputy speaker. PML-N President Shehbaz Sharif has been named as the opposition’s candidate for the office of the prime minister. Leading the race with the most number of MNAs-elect is the Pakistan Tehreek-e-Insaf (PTI) with 158 seats (125 general, 28 women and five minorities). However, candidates elected to more than one seat are required to vacate all except one, which would reduce the tally for the Imran Khan-led PTI, leaving them to rely on support from Muttahida Qaumi Movement-Pakistan’s seven members, Pakistan Muslim League-Quaid’s five, Balochistan Awami Party’s five, and Balochistan National Party-Mengal’s four members. Pakistan Muslim League-Nawaz is in second place with a total of 82 seats, after winning 64 general seats, two minority seats and 16 women seats. The PPP is at a distant third with a total of 53 seats, with 42 general seats, two seats reserved for minorities, and nine reserved for women. Meanwhile, PTI candidate Asad Qaiser on Monday submitted nomination papers for the slot of National Assembly speaker. The name of Asad Qasir was proposed by MNA Riaz Fatyana and seconded by MNA Omar Ayaz. Joint candidate of opposition parties Khursheed Shah also obtained nomination papers for participating in the election of speaker. Maulana Asad Mehmood, son of Maulana Fazlur Rehman, got nomination papers for the slot of deputy speaker. Published in Daily Times, August 14th 2018.